There are only five big cats when it comes to felines, and the Jaguar is one of them. It comes in at number three behind the Lion and the Tiger. It is considered to be the most powerful feline in the Western Hemisphere. The only known location of the Jaguar in the United States is areas of Arizona. They haven’t been found in other areas of the USA since the early 1900’s. Due to the design of spots on the body of the Jaguar it is often mistaken for the Leopard. The Jaguar is a natural when it comes to swimming and they seem to enjoy such an activity a great deal. 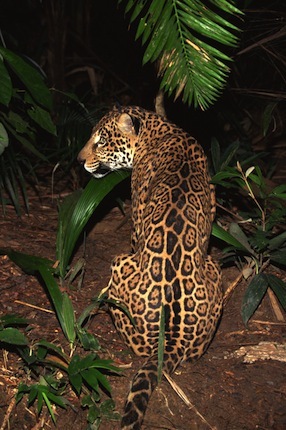 The role of the Jaguar in many ecosystems is one that is valuable. Their hunting habits prevent serious issues including over population and over grazing of the land from occurring. The biting power of the Jaguar is more powerful than other felines. They bite through the skull to kill prey and pierce the brain. Today the Jaguar is considered a near threatened species. Numbers continue to decline in spite of conservation efforts that have been initiated. The entire body of the Jaguar is believed to be mostly muscle. This account for why it has so much strength in spite of the fact that it is smaller than so many other animals in the world. The size of a Jaguar often depends on its location. They can vary from 100 pounds to 220 pounds. Some Jaguars are black in color due to a genetic mutation called Melanism. Others can be white in color due to other genetic differences and they are referred to as Albinos. The black ones are called Panthers. The Jaguar has one of the longest life spans in the wild of all felines. They are able to live for a period of time that is up to 23 years in captivity. The Jaguar is one of the felines that has the ability to roar. In early cultures of the Mayas and Aztecs the Jaguar was considered to be very influential and respected. The diet of the Jaguar is very diverse. They will consume large animals such as monkeys and caimans. They also consume rodents and reptiles. They can even eat turtles and anacondas. Are there three or eight subspecies of the Jaguar? That information seems to be conflicting. The fact is that at this point in time they have been identified by the world of science as 8 subspecies. However there are those groups that ensure that the jaguar has no subspecies. The Jaguar can suffer from parasites from various types of foods that it consumes. When this occurs they are at a high risk of serious health problems and even death. This is because the parasites often will prevent the body from being able to adequately benefit from nutrients in the foods they consume. The Jaguar seems to have no fear at all of humans. There are some documented instances of them killing humans. This is on the rise due to the fact that humans are in space that these animals once had all to themselves. These animals are more active than most other felines. They can be active up to 60% of the time in some locations. They are also known to move around during the day in addition to night time activities.